I am currently sat by the pool in a gorgeous hotel in Antalya, Turkey. Mr Brown is here for a congress with work & I have tagged along for my second holiday in the past 2 months! Until recently I did not have an adult passport & it was to go on honeymoon that made me finally get one organised. I hadn't been on holiday since I was 15 years old, nearly half my life ago! Last year we went on honeymoon in September & we made it a trip of a life time packed full of places & lovely memories. I have always seen other things as more important than a holiday such as paying off student debts, having a car, & general every day stuff! However after the honeymoon I had caught the travelling bug & desperately wanted another holiday - somewhere, anywhere, there was a whole world out there I had been missing out on. With my depression, going part time at work & moving house, holidays just weren't a priority so I gave up thinking about it. Then up popped a trip to Italy. My father in law would turn 60 in October & for his birthday he wanted to take the whole family to the villa in Italy they have been visiting for the past few years. Wow a holiday & so generously paid for by my in laws. Italy was wonderful & I will blog some more about it soon. 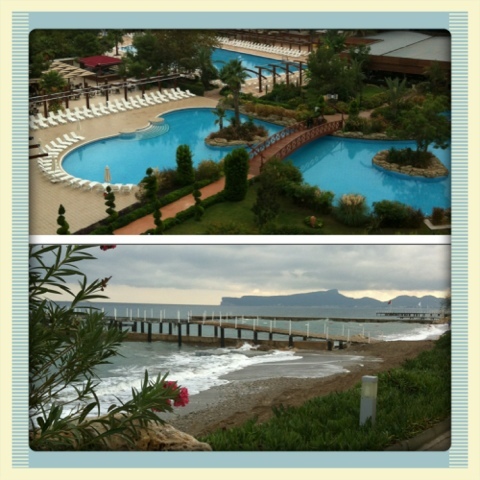 A few months into the year my hubby mentioned that he was going to Turkey & I may be able to tag along. This fell through a few times with his work commitments then suddenly it was back on! Another holiday in November! This holiday is a whole different kettle of fish (never really understood that saying) instead of having loads of family around & very little time on my own, I would be on my own most of the day & with hubby & work colleagues in evenings. I was optimistic, yeah I'll be fine, I'll just sit by the pool I said. I'll please myself. Easier said than done for a girl with mental health issues. As isolating as depression can be, being forced to be on your own in a foreign place has been worrying. Instead of the intended holiday from my anxiety I seem to have packed bag loads of worry & doubts in my case. I am shy, painfully when I am anxious so meeting Mr Brown's colleague was difficult as usuall hubby made me feel at ease & praised my efforts at small talk. Phew that's that done now I can relax right? It seems like no. In packing all this worry & doubt I had no space for any clothes that make me feel comfortable. Self conscious at the best of times, faced with bare arms, legs & clothes I just avoid in the UK I am struggling. So 3 days in I have finally made it out of the room & to the side of the pool. Go me!! Not before changing several times & still feeling very self conscious I might add. Don't even get me started on how I feel nervous I feel at the restaurant having lunch for one!! So for the rest of the holiday must be onwards & upwards. Do holidays make other people stressed or just me?